The early years of this century have already seen two significant downturns: the dot-com bubble-and-burst, and the housing-crash-led recession of 2009. Terry Pham launched his first Dallas-area bubble-tea store during one and survived them both. Now Pham and many entrepreneurs like him are weighing the risks of running--and even more daunting, starting--new businesses in economically perilous times. Pham's lessons learned--based on his experiences and losses as a child of immigrants and rounded out by more than a decade of running the unlikely success story of a specialty tea shop in central Texas--tell a tale of perseverance, loyalty to family (and co-workers) and optimism in the face of adversity. His story offers guidance and inspiration that apply to any business cycle. In a story about economic bubbles, it seems fitting to be discussing another, more fanciful source of bubbles--so-called bubble tea. Originated in Taiwan in the early 1980s (two shops vie over claims to be the original source), bubble tea is simple enough: a base of tea usually mixed with fruit and/or milk. The concoction is typically shaken to mix up those ingredients, resulting in the "bubbles" at the top of a cup of bubble tea. But it's another addition--so-called "pearls," or chewy balls of tapioca starch that float on the bottom of the drink and are sucked up via wide straws--that is the most distinctive part of bubble tea. Bubble tea spread through East Asian countries first, offering shop owners a fun and fruity tea-based drink to target younger, non-tea drinkers. It spread over to the U.S. soon after, hitting college towns and, in particular, Southern California in the 1990s, echoing the juice bar and yogurt store trends of the time, Pham says, before petering out well short of becoming a widespread phenomenon. Indeed, perhaps because bubble tea is so unique and remains slightly foreign--despite attempts to "Americanize it"--in its look, feel and taste, the drink concept never hit the level of a full-on national franchise. Jasmine Smoothie World and Bubble Tea is the largest franchisor, with more than 20 stores nationwide, while Chill Bubble Tea started down that path as well, with stores in Arizona, Texas, Illinois and North Carolina (though it isn't accepting additional franchisees at the moment). Beyond that handful of mostly mall-based franchise locations, bubble tea is most often available via Asian-catered stores, though consumers can also find it in tea and smoothie shops and in a handful of independent bubble-tea spots--like Pham's two Dallas-area Fat Straws stores. 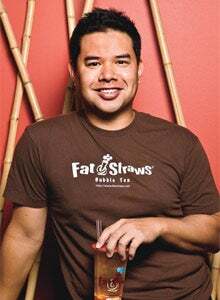 Pham launched his first Fat Straws store in 2002, amid the fumes of the dot-com bubble burst. He had been working in IT and was looking for something new to pursue on his own, he says. After a childhood spent in specialty retail--following in his mother's footsteps at 7-Eleven (more on that later)--he felt comfortable starting a retail business of his own. Why tea? Pham credits the time he spent as a boy back in Vietnam with his grandmother as his inspiration. "It was a ritual, drinking tea with grandma every evening," Pham says. He started his second store in 2007, again riding out the times-are-tough, dollars-are-tight recession of the past few years. This time, he brought his mother, Mae, in to run one of his stores (Pham's wife contributes her graphic design expertise, and someday his three young children may pitch in as well). Fat Straws survived those tough times and is cautiously eying further expansion. Family, tradition and hard work are just a few of the ingredients for Pham's bubble-tea success. Terry Pham's mother, father, two brothers and sister fled Vietnam just days before the fall of Saigon (Terry was born in the U.S.). His father, who served as a fighter pilot in the Vietnamese Air Force, worked various odd jobs before becoming a commercial pilot on small charter planes. Tragically, he was piloting the plane carrying the University of Evansville basketball team in 1977 when it crashed, killing everyone onboard. That left Terry's mother with four small children and few prospects. With the help of a local church, the family made its way to Garland, Texas, a suburb of Dallas, where Mae found work with 7-Eleven. She began working behind the counter, eventually advancing to a field consultant, managing multiple store locations. Terry followed her to work. "I was a kid of 7-Eleven," he says, "cleaning shelves and mopping floors." It was that retail experience Pham shared with his mother that ultimately led him to open his first Fat Straws store in 2002. "Dallas might be the last place you'd expect bubble tea to be successful," Pham says, but he's made it work. Among his first decisions was scaling down from the typical 150 to 200 flavors many tea shops hawk to 15 or 20 most palatable to his customer base. "2002 was a tough time; a lot of people were looking for work," Pham says. "We didn't need a ton of capital to build out and get started. We were able to launch and be profitable early on, growing every year 15 to 20 percent." Fat Straws faces plenty of competition, including coffee chains like Starbucks, smoothie shops and ice cream stores--really any retailer selling a $5-or-so treat in a casual atmosphere. To attract that skewed young customer base, Fat Straws feels a bit like Starbucks: comfortable with plenty of couches and magazines to encourage lounging, albeit with a more carefree, jovial feel, reflecting its more whimsical product. In 2007, Fat Straws launched its second store in the north Dallas area and continued on a growth path--even in 2009, Pham says, at the height of the most recent recession. "That was a scary year," he says. "We did start to see our regulars drop off. People were starting to be more selective with how they spent their disposable income. The word on the street was that most restaurants were losing 20 percent or more of their business." Pham pulled the staff of his two stores together to discuss the future. Many of them were longtime employees who started as high schoolers or college students and had been with the company for some time, becoming like family. Rather than cut back or retrench, Pham says they ramped up quality control and service. "People were losing their jobs and homes," he says. "If they chose to come in here and spend five dollars on a drink, we wanted to make the experience everything they expected--and then some." While a nearby Jamba Juice and Cold Stone Creamery closed during the most recent downturn, Fat Straws survived. Pham credits his focus on creating a superior customer experience. "We wanted the drink quality to be impeccable," he says. "We live and die by every single drink we sell." Just as important as product quality or store cleanliness is creating strong relationships--not only with customers, but among store employees as well. "It may sound hokey, but we tell our staff that we have a reason to exist behind making money," Pham says. "We're about creating relationships. And that includes our staff. Kids start working with us in high school, and they stay with us." In the end, Pham says, the strategy that worked for Fat Straws was one focused on growing sales as opposed to cutting costs. "We ramped up our advertising and tried to use social media to really tap in directly to our customers through Facebook, Twitter, Groupon and LivingSocial. It ended up paying off because we were able to get more people in the door that might not have otherwise come to Fat Straws, and we were able to capture a new audience," Pham says. "Many times when business starts to contract, people have a reactive response, which normally equates to cutting labor, watching food costs and other cost-cutting measures. We tried to do the opposite."